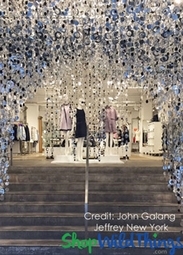 Our silver "Diamante Duo" faceted bead is used for this chandelier. These beads are the same exact bead as our items that use a bead called "diamonds" but there are two LARGER sizes of beads used for the "Diamante Duo": 3/4" and 1/2" beads are used in a pattern (large, small, large, small). This is a chandelier decoration and does not come with a Light Cord Kit but it is designed to hold one. 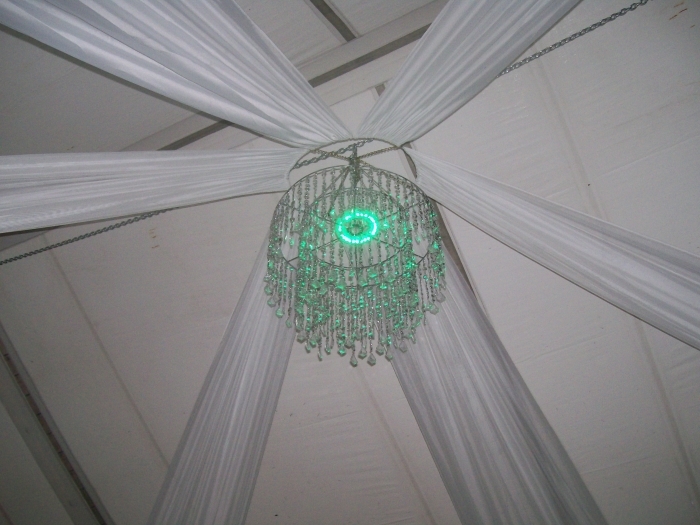 The center of the chandelier already has the hardware needed to hold the light kit in place. 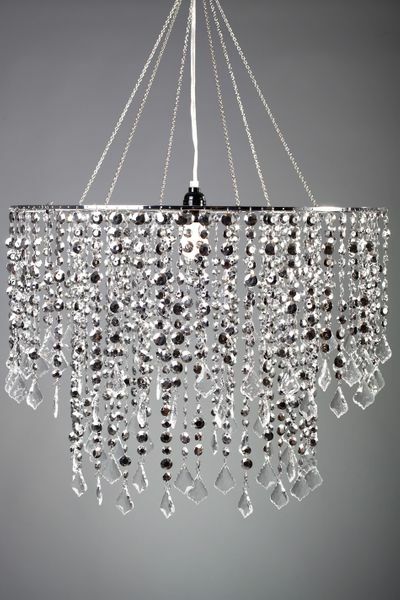 These chandeliers have a beautiful 2" acrylic crystal pendant to finish the end of each strand in style! YES, THIS IS THE TOP PIECE OF OUR HUGE 2 PC ANASTASIA SET!!!! 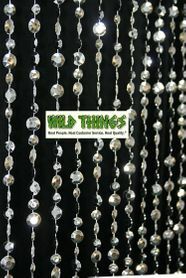 We sell matching silver diamante duo beaded curtains AND the smaller chandelier called "Diamante Duo Delight". There are links to both of those items at the bottom of this page. 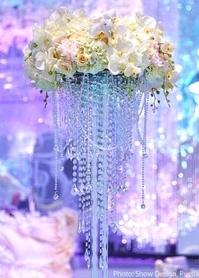 The measurements: It's got 2 tiers: Outter ring 24" Diameter with bead length of 12" Inner ring 16" Diameter with bead length of 18". 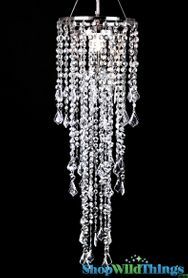 Overall length of chandelier is 18" and the chain adds another 17" for a total of 35". 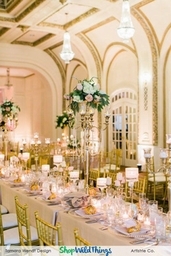 A stunning piece of glamour ! 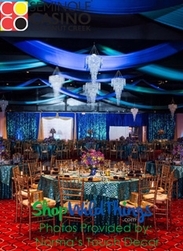 I am so amazed how beautiful this chandelier looks, even without the light ring on! I have it hanging above a seating area in the living room ,where there is no over head light..
ProsJust take it out of the box and it's ready to go! The cool white light ring seems to give off more light than the warm ring I bought ! I get so many comments on the beauty of it ! 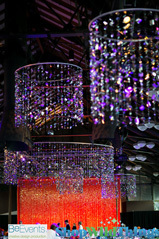 It really is a statement piece of lighting that you can't help looking at ! I am very happy with this beautiful chandelier ! 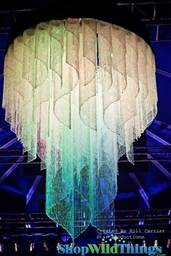 ConsThis is a chandelier with no built in lighting . It will not throw off as much light with a bulb kit or a light ring as it would with lighting wired in. 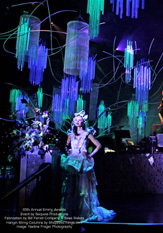 That said , it does give off a sufficient amount to light up a table area or seating group!